Do you want unsurpassed cooling or heating throughout your entire home all year round? Say goodbye to excessively hot days and colder nights with an all in one ducted air conditioning system. The Gold Coast region is known all over the world for its tropical climate and sunshiny days. The heat and humidity typical of this region justifies the cool reprieve offered by air conditioners in most homes, offices and shopping centres. While the Gold Coast gets a good rap for it’s warmth and sunshine throughout most of the year, all locals know the transition between seasons can be anything but the idyllic pictures we see on billboards and travel brochures. Seasonal transitions can often come with cooler nights and brisk, chilly mornings. If you’re one who feels the winter chills, you’ll often need more than a pair of slippers and a jumper to keep you warm. Thanks to the power of ducted AC, you can comfortably enjoy a solution that cools your entire house down during summer and warms it up in winter. With a versatile, all in one heating and cooling system, you can enjoy the perfect temperature in your home all year round. No matter what that temperature is. SPLIT SYSTEM Heating & Cooling Ideal for smaller spaces or single rooms. LIMITED SPACE? Try a single or multi Reverse Cycle System. What is Ducted Air Conditioning and Why is it a Superior Choice? A ducted air conditioning system offers you the versatility of creating your ideal indoor living environment all year round. You can enjoy greater temperature control as this type of system can allow you to create temperature controlled zones. For example, ducted systems such as MyAir allow for individual room temperature control of up to 10 rooms and can be remotely controlled. Imagine setting your home to the perfect temperature before leaving work on a cold winter afternoon and being greeted with a burst of warmth as soon as you arrive home. 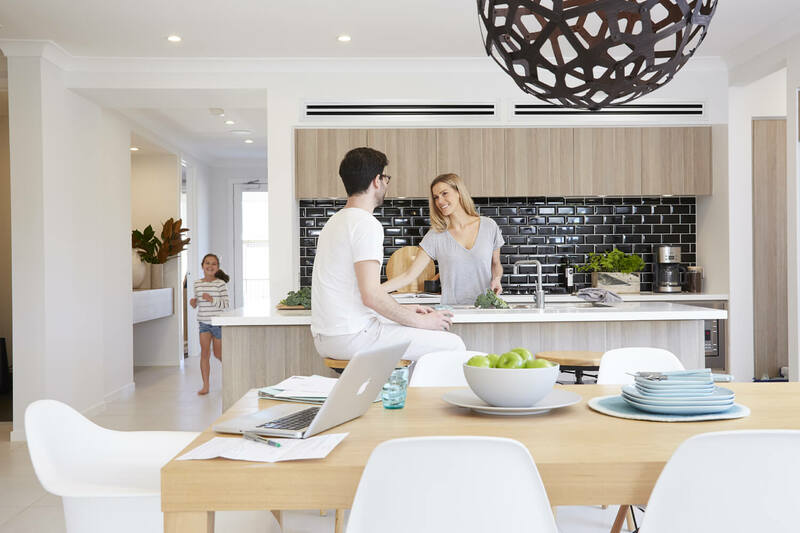 Being able to zone your Gold Coast air conditioning system to suit your lifestyle and the location of your house provides a cost effective and efficient solution. Turn on the AC only in the areas that need it rather than the whole house. If you have a smaller space, a split system air conditioner may be a more effective option for you. Unlike other types, ducted systems consist of a fan coil unit located in the ceiling and flexible ducts that are used to distribute hot or cold air through vents located throughout your home. There is also a motor positioned in a subtle location outside your home but small spaces may not require such a powerful AC system. Is your house too cold in winter and your gas heater struggling to heat up even one room? With only the click of a button, a ducted reverse cycle air con system can heat or cool your entire house. It is the most efficient heating solution that also gives you complete control in every season. Unlike traditional heaters that need to create their own heat, a reverse cycle air conditioner pulls or absorbs heat energy from the outside air to warm the air inside your home. If you go with a ducted system, this heat will reach and cater to every room or selected zones in your house. This is hands down one of the most efficient ways of heating a house using electricity. How much does a ducted heating & cooling system cost? While every space is different and has different requirements, there are a number of versatile solutions that can balance your needs and budget. Purchasing an air conditioning system is a long term investment. At Think Cooling we totally understand the importance of getting it right from the start so that it doesn’t cost you more over time. With a ducted system, you only pay for it once and can enjoy house-wide heating and cooling at the flick of a switch for many years to come. What’s more we only work with well renowned, top quality brands so you can get more years out of your system. Mitsubishi Electric is a leader in the industry and they offer a number of solutions for any space or budget. For households with pets, allergies or asthma sufferers, Daikin is a great option offering you the added benefit of air purification. Ducted air conditioners are best suited for larger homes and offices with many rooms. 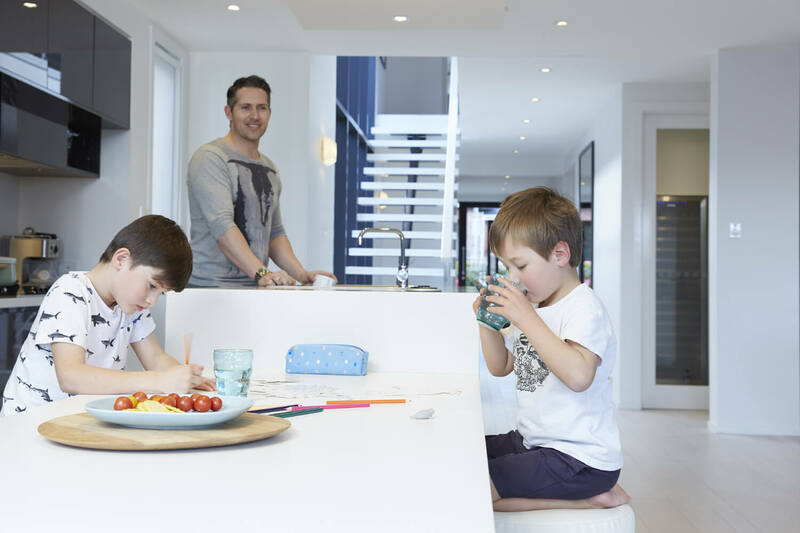 If you are looking for a cost effective solution for a single room, a small apartment or an open plan area, a split system unit may be a better option for you. We can offer you a free in home appraisal to help you select the ideal ducted air conditioning system for heating and cooling your house or office. We cover all of South East Queensland from Brisbane to the Gold Coast as well as Northern NSW. To book in for an appraisal or to receive a free quote, call us on 1300 692 472 today!